The UP Cineastes’ Studio is the student arm of the Cinemalaya Philippine Independent Film Festival. 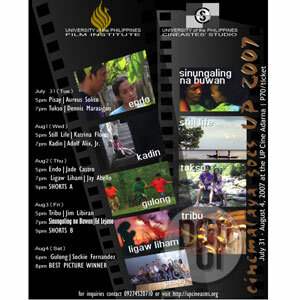 Full-length films of Cinemalaya 2007 will be screened at the Cine Adarna of UP Diliman from July 31 to August 4. Those who missed the screenings of the nine finalists for the full-length feature category of Cinemalaya Philippine Independent Film Festival 2007 can get the chance to watch them at the University of the Philippines this week. The student arm of Cinemalaya, the UP Cineastes’ Studio, will be showing the nine finalists at the Cine Adarna of UP-Diliman from July 31 to August 4. Eight films competed in the full-length feature category during the third edition of Cinemalaya. These were: Endo by Jade Castro, Kadin (The Goat) by Adolfo B. Alix Jr., Gulong by Romualdo "Bona" Fajardo and Anna Liza "Lyn" Fajardo, Ligaw Liham by Emilio "Jay" Abello VI, Pisay by Auraeus Solito, Still Life by Katrina Flores, Tribu by Jim Libiran and Tukso by Dennis Marasigan. Eduardo Lejano Jr.’s entry Sinungaling Na Buwan (Liar Moon) was pulled out from the competition because it was not finished in time for its gala screening. The completed version of the film will be screened in UP. For three years now, the UP Cineastes’ Studio has been bringing the Cinemalaya festival to the UP community and to other universities as well. The organization is well known for its continuous film exhibitions in the past years and tie-ups with the UP Film Institute in holding events such as the UP Film and Video Festival for independent amateur/professional filmmakers, the Black Beret Film Festival for student filmmakers, Russian Film Festival, Fade to Black, and the 16mm Film Festival. The Cineastes Studio opens horizons for its members to learn and hone their skills by participating in actual film shootings. From the production of award-wining films and video, to co-producing the first-ever independent film released in cinemas (Duda/Doubt), up to the publicity and marketing of quality films (Ang Pagdadalaga ni Maximo Oliveros, Mga Pusang Gala, Pinoy Blonde)—members of this organization continue to promote independent films in the country. 7 pm | Kadin (The Goat) by Adolfo Alix, Jr.